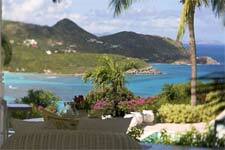 St Barts has a handful of hotels, however renting a private home or ocean-front villa is much more popular with visitors. In this sense, St Barts sets itself apart from other Caribbean destinations that favour large hotel chains and hotel room lacking intimacy or personal touch. In particular, for the discerning traveler who is becoming increasingly demanding in their holiday rental requirements, St Barts offers a spectrum of choice in architecture and interiors. 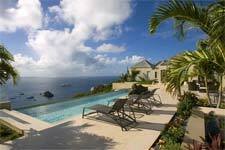 Much in demand is Villa SIB CJB, a spectacular new four-bedroom villa in Colombier with a stunning view of Gustavia harbour that has played host to a number of celebrity guests. This contemporary villa was designed by renowned local architect Olivier Dain and offers unparalleled elegance combined with the ultimate in comfort. Decorated with an eclectic mix of oriental antiques, sculptures and modern art, the home comes complete with a gourmet kitchen and media room. Holidaymakers who aren't inclined to drive down to the beach can make good use of the large lap pool and two Jacuzzis. For travelers seeking a more tranquil setting, there is villa SIB VGM, a classic colonial style villa set in a Garden of Eden style glade, with a stunning view of St Jean Bay. Such villas are ideal for entertaining and can be found with all the creature comforts of a guest's primary residence, albeit in a setting lined with tropical palm trees. Also popular with the jet-set, are villas located in the Mont Jean area, such as the recently renovated villa SIB SEL which faces the wild part of Pointe Milou and has a panoramic view of the endless azure ocean. The front door opens into a contemporary living room with a view across a large terrace housing oversized red sofas and arm chairs, and a lap pool beyond. Each of the villa's rooms is decorated with light-coloured wood furnishings and elegant Kenzo fabrics. The well-equipped chef's kitchen spills out onto a stylish outdoor dining area offering the ideal space to host a delightful meal en pleine air. And this is where St Barts surpasses other fashionable destinations – in its ability to deliver the best you would expect from home with the hassle-free approach of the islands.